What is Guacamelee you might ask? Well, it’s a sidescrolling open-word Mexican themed Metroidvania style action platformer. It sounds awesome and it is awesome. The guys at Drinkbox delivered (again) a fantastic and hilarious game. In Guacamelee you play as Juan Aguacate, a forever alone guy which turned into a legendary luchador in order to save his El Presidente’s daughter who is kidnapped at the start of the game by the evil Carlos Calaca and bring balance to the universe. 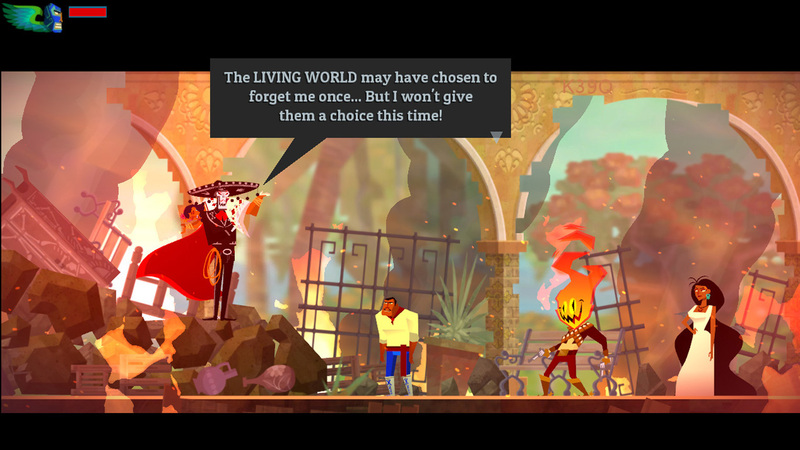 So at the beginning of the game, Calaca shows up in the peaceful town of Pueblucho and starts his evil plan, to merge the world of the living with that of the dead. The why is explained throughout the game, but I will not spoil it for you. Also ,he kidnaps the El Presidente’s or how he like to call her “his soon to be wife”. Juan jumps in to save the day, as forever alone Juan not super luchador Juan, and he is killed in the process. Luckily in the other world ,he is greeted by a friendly face and is given the legendary mask of the luchador. As he wears the mask, he becomes the legendary luchador and from there the game officially starts. Throughout the story ,you’ll come by some very interesting allies and enemies who all have fantastic and funny dialogues. One that I particularly liked was the mentor, the goat guy who gave me all the cool abilities that I will describe down below. His dialogue is one of the funniest ones I’ve ever seen in a game like this. Everything in Guacamelee is funny, from the diAlogue to the art sTyle, to the refereNces, everything in this game will make you smilee. The game is rich in pop culture references, like memes, videogames, characters etc. I managed to snap some images with my phone from the game (I am really sorry for the sh*tty quality, I know I should invest in a capture card…) and you can find some of them stitched together in a big picture down below. Now back to the goat guy, as he is one of the characters you’ll meet the most in the game. When Juan is transformed into the luchador, he doesn’t have any special ability, apart from his normal punch and kick combo and his grab. Here comes in play the goat mentor. Throughout the world there are some statues that when destroyed will grant you many different abilities, that will not only help you fight the enemies, but also help traverse through the world. Throughout the story you’ll encounter different enemies, some are easy to fight, some can be a pain in the a$$. Later in the game some of the enemies will be enveloped in a color coded shield and you’ll have to use the specific ability to break it in order to kill the enemy. The game is always in a constant evolution, it throws at you new gimmicks, mechanics, so the game wouldn’t get stale and boring. Alright guys, we don’t have a code of Guacamelee to giveaway, but what we have are two codes for two awesome PS Minis games. One code is scattered throughout this review, check the images, check for typos/uppcase, check everywhere. If you manage to find it, write a comment down below! The second one we’ll give away to a follower who tweets this message. Happy hunting! Remember when I told you this was a metroidvania style type of game? This means that the world is not available to fully explore from the get go. In the world there are color coded blocks that block the path and in order to break and access into these areas you need the abilities you get from the goat man. So to break red blocks you need the uppercut, for the blue ones you need the dash punch, for the yellow ones you need the headbutt, for the green one you need the ground pound and for the orange one you’ll need the run on walls ability. But all of these abilities are not only used for combos and for accessing new areas, they are also used in platforming. For example the uppercut allows you to extend your jump just enough to access some initially out-of-reach ledges. Each upgrade adds a new level of excitement and later in the game you’ll need to string all of these abilities with one another to traverse levels filled with insta-death spikes. YES IT GETS AMAZING!!! The world opens even more when you get the ability to switch between dimensions, being that of the living and that of the dead. What maybe a wall on the living dimension, may not be there in the dead one. How the developers use this mechanic is incredible and later in the game, some of the “rooms” can be difficult to traverse, but will give a lot of satisfaction when you finally manage to get to the other hand. Also the most important thing in Guacamelee, you can transform into a frickin chicken! Tell me where have you seen this before? NOWHERE! Guacamelee is a game that does not take itself seriously, it’s full of humor and that’s one of its main strong points. The visual style is fantastic too, highly influenced by the Mexican culture is striking to look at. Vibrant colors, angle shaped models and a unique style of gradients use, make this one of the best looking game on the PS3. You know the saying: “It’s the little things that get you”, well Guacamelee is full of small details. Switching the dimensions does not only change the layout of the level, but it will also change its art style. Where there is a cemetery in the living dimension, there will be a party in the dead dimension. Where there is a poster in the living one instead in the dead one there will be a picture of a skeleton. It’s striking to see these little changes, Drinkbox Studios really outdid themselves here and they need a big round of applause for it! Even though Guacamelee is a short game, can take up to 5 hours to beat maybe some more (2432) if you want 100%, it’s an outstanding game that will keep throwing new things at you to keep everything fresh and interesting. It looks fantastic and it controls fantastic. It features co-op, but it doesn’t really add something worth mentioning. Also Guacamelee is the second game, correct me if I’m wrong, that has cross-buy and cross-save between the PS3 and PS Vita. So for the price of one, you get the games on both consoles. Unfortunately I don’t have a PS Vita to experience the game, but I’ve heard that it maybe the best game the Vita has at the moment! During my playthrough I encountered some glitches, four to be fair, that totally “broke” the game and I needed to restart the save file in order to progress. I don’t know if anyone else got this problem, but to tell the truth I was a little disappointed. Well thanks :D Be sure to keep checking duuro.net we have more amazing competitions coming soon! Wow, actually pieced together the hints and redeemed Velocity! I had a had time seeing the one in the picture at first :-) anyways thanks! Wow, I actually pieced that together finally and redeemed Velocity! I had a tough time seeing the “hint” in the image at first :-) anyways, thanks!!! I finally put it together :-) had some trouble seeing that one in the image, but anyways, thanks! !